Bentley Motors Limited will build the luxurious four-seater convertible Azure at the home facility in Crewe, Cheshire, as the plant continues to adopt a more flexible approach to luxury car manufacture. The latest new model joins the Bentley line-up next spring and will become the flagship car of the Bentley range. The realignment of production, brought about by the continued success of the new Continental family of cars, includes further refinement of the assembly process for the established Arnage. 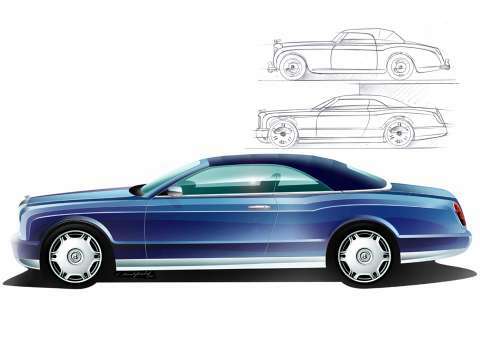 A purpose-built facility brings together the latest technology with unprecedented levels of craftsmanship for both the new Bentley Azure and its stablemate, the Arnage. The Azure body-in-white facility blends traditional hand-built skills with robotic technology, required to ensure consistent build quality. The dedicated assembly area enables around 6,500 intricate spot welds to be carried out by hand, with robotics being used to accurately locate and clinch all the closure panels. Additionally, the finishing processes have been relocated away from the main assembly halls and into the self-contained Mulliner department, where the dedicated workforce specialise in bespoke vehicle production. The open-topped Azure was first seen at the Los Angeles Motor Show in January, when a show car named the Arnage Drophead Coupe debuted in the winter sunshine to gauge customer reaction. In April, the company confirmed that it would build the car and at Pebble Beach, California last month, revealed the name 'Azure'. The production version of the car will be unveiled next week at the International Motor Show in Frankfurt. The car is yet another in a series of new products from the Crewe design studio, conceived and built at the self-contained Bentley site at Crewe, in Cheshire, where the company has been headquartered for over half a century. The dedicated Crewe-based Bentley engineering team worked closely with the co-located manufacturing team in planning every aspect of production from body-in-white, paint, hood fit and ultimately, assembly of the car itself. In addition, the body shell, engine and chassis will all originate in Crewe. The exceptionally high levels of handcraftsmanship - the work of the Bentley woodshop, leather shop and seat trim specialists - accentuate those characteristics that will mark the car out as distinctly a Bentley. "The plant has a long heritage of producing high quality, luxurious cars and is perfectly placed to produce this new pinnacle model, both in terms of the sophisticated facilities and the experience and skill of this workforce", said Member of the Board for Manufacturing at Bentley, Doug Dickson. "The expertise of the Crewe team here in delivering dream cars is unparalleled." The exclusivity of the car means that the total anticipated production of a few hundred units is largely already pre-ordered. Bentley Motors has a presence in around 40 markets across the globe, with a network of 152 dealers spanning five continents. At the crest of a period of intelligent growth, the company stands committed to providing the ultimate expression of customer choice in the Bentley Arnage range through to the definitive British grand tourer in the Bentley Continental GT. A Porsche .... but not as you know it!